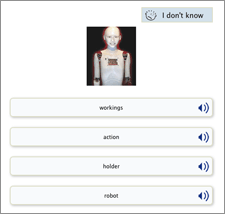 Let's take a closer look at the vocabulary quiz, the free quiz option. 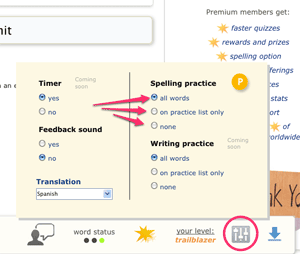 Spelling quiz and combo quiz focus on spelling and are premium features. Did you ever think you had learned something, when in reality you only formed a pattern for the way the question looked? Through an extensive, patent-pending process, we present your practice words in varying formats and match them with different word partners at every review. Mousing over a field with audio icon plays the pronunciation. Click to make your selection. At every review, we present the question in a different format and with different alternates. This keeps your brain challenged. This prevents false positives: The illusion that you know something, when you really just recognize the question format. The goal is to check for real understanding of the word, not a pattern associating the word with a static question. 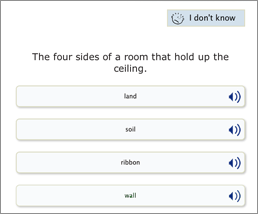 As an add-on, premium members can add spelling tutoring to their vocabulary quiz. 1 Read the definition. Listen to the word and sample sentence. Mouse over the settings icon in the lower pop-up bar of the vocabulary quiz. Checks spelling for those words you knew instantly plus those that completed the review cycle. Check spelling for words you struggled with. Select "none" to turn spelling off. Spelling practice is a premium feature. Each session is designed just for you. a - You got it wrong: It's added to your practice list for follow-up review. b - You got it right: It's set aside as known. c - You got it right, and "re-testing of priority words" is selected in your preferences: You will see the word one more time at a future quiz, to double-check. Next, we'll review words that you got wrong before. A practice word continues the practice cycle until you get it right three times in a row. Make sure you don't overload your account with added priority words. Allow time for this most important part of the quiz! 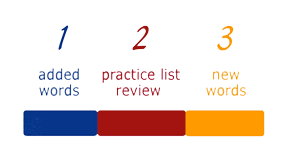 Review practice words each session for the largest benefit. Lastly, LearnThatWord introduces new words to you based on your goal settings. You can review and change these in your preference settings. If you only want to study your own word lists, select "my own word lists" as your personal goal. 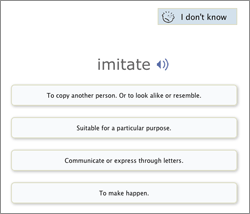 LearnThatWord and our Open Dictionary of English are open, collaborative projects. We are committed to expand, evolve, and improve constantly. 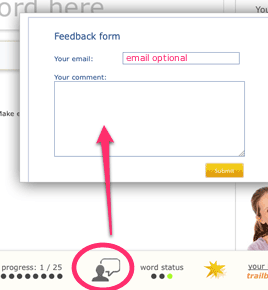 Your ideas and feedback are always welcome and can be quickly submitted via the comment field, found during the quiz. In the spelling and combo quiz, the comments button is right below the sample audio.